New Delhi: India, the world’s fastest growing mobile market, plans to start auctioning third generation (3G) wireless spectrum as scheduled from 14 January, setting at rest speculation that the government may not be able to free up enough spectrum for four licences, and helping to curb the ballooning fiscal deficit. 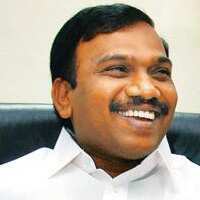 The “auction will be according to the schedule", telecom minister A. Raja told reporters on Monday after a meeting of a ministerial panel on spectrum. “Allotment of spectrum to maintain the level playing field will be by August 2010. Allotment to the four service providers will be simultaneous." The minister indicated that the department of telecommunications (DoT) would be able to overcome the defence ministry’s reluctance to give up the frequencies that will be needed to accommodate four new operators in 3G in addition to the state-run incumbent in each service area. “There is a consensus in the eGoM on vacation of spectrum and it would be allotted simultaneously to all the four winners by August 2010," Raja said. DoT had earlier expressed concern over the delay in the vacation of spectrum by the defence ministry and had suggested, in its note to the empowered group of ministers (eGoM), that only three slots should be auctioned, as opposed to the planned four. The government has estimated that it will be able to raise Rs25,000 crore from the sale of 3G spectrum and had set a reserve price of Rs3,500 crore for 3G spectrum and Rs1,750 crore for Wimax (wireless broadband) licences, both of which are being auctioned. The auction is expected to give finance minister Pranab Mukherjee some breathing space in a year that sees borrowings surge to a record because of stimulus measures introduced to revive growth after being squeezed by the global financial crisis. “If the government is able to book all the 3G revenue this fiscal itself, then there might not be any requirement for additional borrowings above what the government has announced," said Indranil Pan, chief economist, Kotak Mahindra Bank. “If it books only 25% of the revenue this fiscal and the rest in the next fiscal, then the additional government borrowing this year will depend on direct tax collections." Mukherjee recently said he expects direct tax collections to touch Rs4 trillion above the Rs3.79 trillion budget estimate. “The third advance instalment of direct taxes look okay," Pan said. “Therefore, there seems no serious risk on the borrowing side." The government has budgeted for a fiscal deficit of Rs4 trillion, or 6.8% of the gross domestic product, this year with borrowings set at Rs4.51 trillion compared with last year’s Rs3.06 trillion. In the interim budget for 2009-10, Mukherjee had budgeted Rs20,000 crore as receipts from the auction. The auction has been hanging for at least two years and the date has been postponed four times. The latest hurdle was posed by the defence ministry’s objections. The defence ministry told DoT earlier this month that only 10MHz of 3G spectrum could be vacated and that it was still using the frequency allotted to state-owned Bharat Sanchar Nigam Ltd (BSNL) and Mahanagar Telephone Nigam Ltd (MTNL). This would mean the spectrum available for auction could accommodate only one private operator. As per a previous decision of the eGoM on 3G, four private operators were to get spectrum. The government has already mandated BSNL and MTNL to start 3G services in the circles they operate in. The state-owned companies will need to match bid prices in those circles once the auctions are completed. 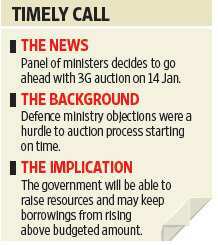 DoT rejected the defence ministry’s claim that it holds all the spectrum (1,920- 1,980Mhz) needed for the long-delayed auction of frequencies required for third-generation (3G) mobile phone services that’s set to be held next month. “DoT does not agree with the ministry of defence that the entire 60Mhz of spectrum in the 1920-1980Mhz band, pan India, is with the defence (ministry) and that only 10Mhz 3G spectrum released by the defence (ministry) on signing of MoU is available for auction," it said in an internal note for the eGoM, headed by finance minister Mukherjee. A copy of the note was reviewed by Mint. “Since DoT is the custodian of spectrum and as per DoT records, duly reconciled with ministry of defence in April 2007, 3G spectrum in the 1,920-1,980 Mhz band is available for commercial use," the note added. Shauvik Ghosh and Asit Ranjan Mishra of Mint contributed to this story.